Copyright © 2000, Mike Haley and Oregon Kayaking. No part of this page may be reproduced, linked, or copied without the express written permission of Mike Haley and the Oregon Kayaking Webmaster. Winberry Creek is a fun little class III+ creek that is a mere forty minutes southeast of Eugene. The run is a great training ground for up and coming creekboaters. For advanced paddlers and expert playboaters I recommend medium-high water or flood on Winberry - great waves and holes develop at flows above 750 cfs. It is possible to put in 1 mile up on the South Fork for immediate class three gratification in short, narrow gorge. However, this section has collected a fair bit of wood over the years, so the confluence of the South and North Forks is the usual starting point. A 100 yards below the put in the creek is busy with the first major drop, a long, wide slide that often collects wood in the narrow exit. Be sure to scout here! Below The Slide are several class II drops until boaters arrive at the first road bridge about a mile and a half downstream. The rapid just above the bridge is known as Bloody Elbow (class III+) and should be scouted on the drive up. 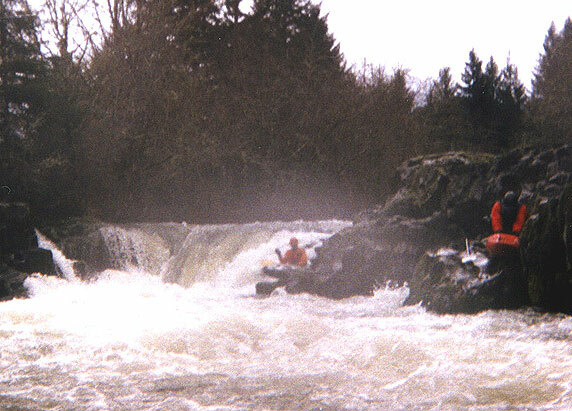 This violent rapid sometimes gives boaters an unexpected stern squirt, so be ready! Just below the main drop is a sticky wave hole that should be punched with speed. If you plan to play in there, expect to get a work-out. The Author disappears into Bloody Elbow. The tree in the photo is now gone, so the rapid can be run on the right side also. 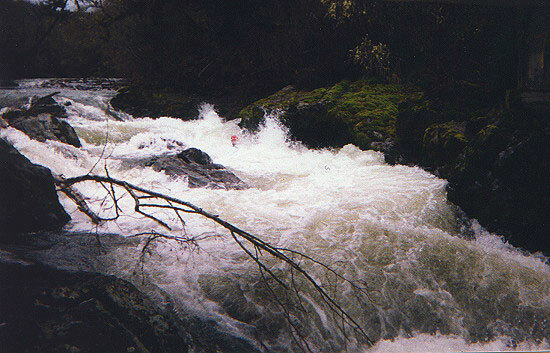 About a half mile downstream of the first bridge is a three-quarter mile gorge section (class III+) that is a blast at high water with many big, fast surf waves. At lower flows the boulders poke their heads out creating many interesting and sometimes blind boulder gardens. Most of these technical drops can be boat scouted with some skillful eddy hopping. The run out from the gorge contains inumerable surf waves to play on. The biggest drop on Winberry is a couple of miles below the gorge, so don't run any horizon lines without scouting once you leave the gorge. After dropping over a two or three foot riverwide ledge, eddy out about a hundred feet downstream on river left for the scout and/or portage. Bridge over Troubled Water is a class V drop marked by a small private bridge just downstream from a nasty six foot falls. This drop is likely easier at high flows when you could squeak by on the left, but at any other flow most of the creek slams into a rocky keeper that has severe pinning potential. Run left or portage very quietly on the left because this is private land! Bob completes the portage around BOTW. Below here the creek is mellow for the last half mile to the take out, the FS bridge over the creek. Flows: 250 cfs and up. Winberry Creek runs only after appreciable rain or during early season snowmelt. This creek only corresponds with Pat Welches usually reliable calculations about half the time. For a more educated guess, I always figure it this way: The approximate level is about 25% of the inflow to Fall Creek Reservior. Call 937-3852 for the flows. Hazards: Because of the small size of the creek, sweepers and strainers can sometimes be a problem. As of March 2000, the only portage required was at the exit to The Slide.